The class' average score or the school's average score. 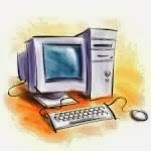 A computer is an electronic device, operating under the control of instructions (software) stored in its own memory unit, that can accept data (input), manipulate data (process), and produce information (output) from the processing. Generally, the term is used to describe a collection of devices that function together as a system. The Computer: "I only know Binary 0s and 1s"
Programmers write these instructions in different programming languages. Interpreters are another important category of translator programs.